Ovarian cancer, Cytotoxicity, CaOV3 cells, SKOV3 cells, HUVEC cells, C. zedoaria, Myanmar medicinal plant. Globally, ovarian cancer is a major gynecological problem and one of the leading causes of cancer death in women. It is the seventh most common cancer diagnosed among women in the world. There were estimated 238719 new cases of ovarian cancer worldwide in 2012, accounting for 3.6 % of all cancers diagnosed in women . Ovarian cancer cases were highest in the European region, followed by Southeast Asia . According to latest Malaysian National Cancer Registry report, ovarian cancer is fourth commonest female cancer, accounting 6.1% of 56,713 new cases of women in 2007-2011 . Sivanesaratnam  described as the survival rate is only 41.6% and the elusive nature of the disease results in 70% of the cases being in an advanced stage at presentation. There are also issues of chemoresistance, recurrence even with second line chemotherapy, shorter disease free survival and no adequate screening method for early detection. It affects the quality of life of the patients. In view of these reasons, we aimed to test ovarian cancer celllines in order to assess the pharmacological ability of selected medicinal plants to prevent or treat ovarian cancer. Cordell  has highlighted the immense potential of natural products in drug discovery and why it is important to be involved in global sustainable initiatives to improve health care. Plants from the tropical rain forest are biologically and chemically diverse as they synthesize various chemicals as a defense against pests, diseases and predators. They are an excellent reservoir of medicines and chemical leads with which we can design and synthesize new drugs. Curcuma is one such popular medicinal plant. C. zedoaria is a rare species which is available in some parts of Asia and the world . Curcuma zedoaria is one of the native plants of Myanmar . The farms for Curcuma are located in a particular area of central Myanmar. Cultivation starts around October and the land yield good rhizomes. These rhizomes are usually collected in January to February every year. The rhizomes of C. zedoaria are yellowish white, smell of camphor, and are known as “Nanwin Myo”. The rhizomes of C. zedoariaare different in appearance, colour and smell from those of C. longa/ domestica. Few reports were found on their chemical components and biological activities. Lobo et al. compiled 27 biologically active compounds isolated by various researchers. There are some reports on their biological activities, such as antimicrobial, antifungal, anti-amoebic, larvicidal, analgesic, anti-allergic, cytotoxic and anticancer activities. Among these pharmacological activities, cytotoxic and anticancer activities are more interesting for cancer prevention and new anticancer drug discovery. Determination of cytotoxicity is required for pre-clinical screening of potential drugs, including plant extracts . The cytototoxic and anti-tumour properties of extracts and some compounds of C. zedoaria have been demonstrated on various cancer cell lines and animal models [10-16]. Seo and co-workers  revealed that the water extract of C. zedoaria may play an important role in the inhibition of cancer metastasis. To date, there is a very limited number of studies in the literature on the activity of C. zedoaria on ovarian cancer cells since the earliest work done by Syu et al. in 1998 . Traditionally, the use of C. zedoariain pregnant women is prohibited because of the risk of abortion, as described in the Chinese Pharmacopoeia . Since medicinal herbs and their phytochemicals are potential novel leads for developing antiangiogenic drugs , we postulated that C. zedoaria would have anti-angiogenic properties. HUVEC cell lines were used to describe the mechanism of action of a chemotherapeutic agent related to the anti-angiogenic properties as a classic model for anti-angiogenesis . Therefore, we tested CaOv3 (epithelial ovarian cancer cells), SKOV3 cells (metastatic ovarian cancer cells) and HUVEC (human umbilical vein endothelial cells) in our study to investigate the cytotoxicity of various extracts of C. zedoaria against these three cell lines. The rhizomes of C. zedoaria were collected from the farm in Kyauk-Se township near Mandalay, central Myanmar. The plant and rhizomes of C. zedoaria were authenticated by the taxonomist, University of Traditional Medicine, Mandalay, Myanmar (UTMM). The herbarium number is No.10 of the Herbarium Museum of UTMM. The extracts from rhizomes were prepared as described by Arya  at Shimadzu-UMMC Centre for Xenobiotics Study (SUCXes) laboratory, Pharmacology Department, Faculty of Medicine, University of Malaya. Briefly, 500 g of rhizomes were coarsely powdered and placed in a cellulose thimble to extract with 100% n-hexane using hot extraction technique with a Soxhlet extractor for 24 h. Further extraction of the obtained defatted residue was carried out using 100% chloroform, followed by 100% (absolute) methanol and lastly with 100% pure water. The solvents from each crude extract were dried by rotary evaporator under reduced pressure at a maximum temperature of 40ºC. Further to the extraction, all the crude extracts were properly stored in a freezer at -20º C until further use. All the crude extracts were subjected to GCMS-MS analysis for the qualitative analysis of major compounds. The potential active compounds from various crude extracts were identified using GCMS-MS as described by Arya et al. .
CaOV3 (epithelial ovarian cancer cells), SKOV3 (metastatic ovarian cancer cells) and HUVEC (Human Umbilical Vein Endothelial Cells) and McCoy’s 5A medium (modified) were purchased from ATCC (American Type Culture Collection). Roswell Park Memorial Institute (RPMI) 1640 culture medium, penicillin-streptomycin liquid, and trypsin 2.5% (10X) were purchased from Life Technology, USA (GIBCO). Fetal Bovine Serum, Hank’s Balanced Salt Solution (HBSS) and Dimethyl Sulfoxide (DMSO) were purchased from Sigma- Aldrich Chemicals (St. Louis, MO, USA). The culture wares and consumables were procured from Orange Scientific (Braine-l’Alleud, Belgium). Hexane, methanol and chloroform were supplied by Merck, Darmstadt, Germany. E-Plate 96 and E-Plate 16 for Real Time Cell analysis (RTCA) were obtained from Roche Diagnostics, USA. These plates were read to measure the cell proliferation using xCELLigence Real-Time Cell Analysis (RTCA system, Roche Diagnostics GmbH, Germany). The tests were performed in the CENAR (Centre for Natural Product Research and Drug Discovery), Department of Pharmacology and Department of Pharmacy, Faculty of Medicine, University Malaya. CaOV3 cells (adenocarcinoma ovary, epithelial ovarian cancer cell line), SKOV3 cells (metastatic ovarian cancer cell-line, which were derived from ascities of chemo-resistant adenocarcinoma ovary), and HUVEC cells (human umbilical vein endothelial cell-line) were obtained from American Type Culture Collection (ATCC). The frozen cells in cryo vials were thawed and subcultured in a sterile manner as per protocol described by ATCC. Initially, McCoy medium was used for CaOv3 cells and SKOV3 cell culture. Later, these cells were gradually familiarized with RPMI 1640. Endothelial Growth Medium (EMG) was used to maintain HUVEC cells. The cells were kept at 37°C with 5% CO2 incubator. The cells in culture flasks were observed under the microscope for growth, and were used to seed when 70-80% confluency was achieved. In order to measure the cell viability and cell growth in a continuous manner at multiple time points, we performed Cytotoxicity and Real-Time Cell Growth Assay using xCELLigence Real-Time Cell Analysis (RTCA) system, as described by Looi et al. . In brief, SKOV3 cells in exponential growth phase were seeded in E-96 plates with electrodes after taking background measurement of 50 μl of culture medium. The optimal cell numbers in each well were determined before the actual experiment. After seeding the cells at a density of 3 × 103, the plate was placed back in the RTCA system and kept with 5% CO2 at 37°C for 24 h to grow to the log phase. Then, the cells were treated with different concentrations of various extracts of C. zedoaria (200, 100, 50, 25, 12.5, 6.25 μg/ml) dissolved in medium. Paclitaxel (taxol) 1 mmol/ml (0.85 μg/ml) was used as a positive control. The cells were monitored continuously for 72 h.
Similar procedures were performed to culture and treat the CaOV3 and HUVEC cells. We observed the different responses of cell growth in different types of cells to each extract of C. zedoaria in real-time cell growth inhibition for 3 consecutive days using RTCA. These inhibitions were in time- and dose-dependent manner (SKOV3 cell-lines in Figures 1a-1d), CaOV3 Cell-line in Figures 2a-2d and HUVEC cell-line in Figures 3a-3d. Figure 1: (a) Hexane extract of CZ inhibits SKOV3 cells proliferation in a time- and dose-dependent manner (IC50=60.48 μg/ml). (b) Methanol extract of CZ inhibits SKOV3 cells proliferation in a timeand dose-dependent manner (IC50=75.97 μg/ml). (c) Chloroform extract of CZ inhibits SKOV3 cells proliferation in a time- and dosedependent manner. (IC50=61.05 μg/ml). (d) Water extract of CZ inhibits SKOV3 cells proliferation in a time- and dose-dependent manner (IC50=23.50 μg/ml). Figure 2: (a) Hexane extract of CZ inhibits on CaOV3 cells proliferation in a time- and dose-dependent manner. (IC50=93.87 μg/ ml); (b) Methanol extract of CZ on CaOV3 cells proliferation in a time- and dose-dependent manner. (IC50=106.36 μg/ml); (c) Chloroform extract of CZ on CaOV3 cells proliferation in a time- and dose-dependent manner (IC50=164.57 μg/ml); (d) Water extract of CZ on CaOV3 cells proliferation in a time- and dose-dependent manner (IC50=62.8 μg/ml). 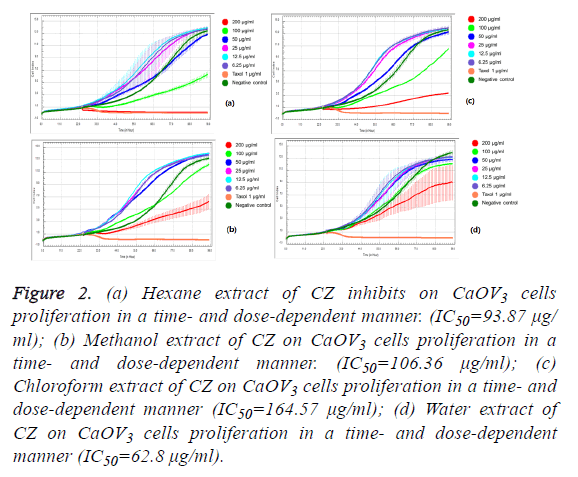 Figure 3: (a) Hexane extract of CZ on HUVEC cells proliferation in a time- and dose-dependent manner (IC50=13.18ug/ml); (b) Methanol extract of CZ on HUVEC cells proliferation in a time- and dosedependent manner (IC50=36.82 μg/ml); (c) Chloroform extract of CZ on HUVEC cells proliferation in a time- and dose-dependent manner (IC50=14.87 μg/ml); d) Water extract of CZ on HUVEC cells proliferation in a time- and dose-dependent manner (IC50=40.28 μg/ml). The calculated IC50 doses for each extract to different cell lines were shown in Table 1. Our results showed that water extract of C. zedoaria strongly inhibited the cell growth of SKOV3 cells (IC50=23.50 μg/ml) and moderate inhibition was noted with hexane and chloroform extract (IC50=60.48 μg/ml, 61.05 μg/ml respectively). Our results also revealed that hexane and chloroform extracts of C. zedoaria were potent growth inhibitors for HUVEC cells (IC50=13.2 μg/ml, 14.9 μg/ml) and methanol and water extract were moderate growth inhibitors for HUVEC cells (36.8 μg/ml, 40.3 μg/ml). Table 1: Real time cytotoxic activity of various extracts of CZ against selected human cancer cell lines determined by Real Time Cell Analyzer (RTCA) (IC50 in µg/ml). Compounds identified in hexane fraction of C. zedoaria using GC-MS were shown in Table 2. RTa: Retention Time in Minute; Compoundb: Compounds listed in order of their relative area percentage. Table 2: Compounds tentatively identified in hexane fraction of C. zedoaria using GC-MS. Ovarian cancer is known to be a most lethal gynaecological cancer even with optimal therapy. Therefore, the discovery of newer and more effective chemotherapeutic agents is inevitably required to improve the clinical outcome, survival and quality of life. In this innovative research, we were able to evaluate the anti-proliferative effect of four different extracts from C. zedoaria from Myanmar. We found that these extracts contained potential active compounds according to polarity and there were more compounds detected in hexane extract of C.zedoaria rhizomes. Previously, some compounds were isolated from CZ from various countries such as China, Japan, Korea, India, Bangladesh, Thailand, Indonesia and Brazil [10,23-31]. Because of the typical smell of CZ rhizomes, we postulated that CZ might contain more chemical constituents in hexane extract. Hexane extract contains essential oil with volatile nonpolar compounds which give rise to the aroma of a particular plant or its rhizomes. We found a majority of these compounds in hexane extract. The phytochemical, biological, pharmacological and ethnomedical properties of CZ were extensively reviewed by Lobo . For cytotoxic and anti-proliferative activities, some cancer cell lines such as human lung carcinoma cell line and prostate cancer cell lines , lung, nasopharyngeal cancer cells, leukaemia and murine lymphoma cells, human promyelocytic leukemia HL-60 cells , liver cancer cells, melanoma cells and HUVEC cell lines  were tested in-vitro using extracts and compounds from CZ. Regarding the ovarian cancer of our interest, the cytotoxic activity of CZ was demonstrated against human ovarian cancer OVCAR-3 cells . Recently, the compounds isolated from CZ rhizomes collected from Indonesia were reported to exhibit strong antiproliferative activity and also found to induce apoptotic cell death on MCF-7 breast cancer cell line  and on MDAMB- 231 human breast cancer cells by petroleum extract from CZ from China . In this study, we investigated the cytotoxic activity of four crude extracts against two ovarian cancer cell lines and primary endothelial cell lines. To the best of our knowledge, this is the first report on the cytotoxic activity of CZ rhizomes cultivated in Myanmar. There are various spectrophotometric or fluorometric assays for determination of cytotoxic activities as described by Cordier and Steenkamp . We chose RTCA as this technology enables us to measure cytotoxic effect of CZ extracts in real-time. In addition, the results can be monitored up to 72 h with a simultaneous comparison with a standard chemotherapeutic drug . Our findings are similar with cytotoxic activity of CZ obtained from Indonesia . However, cytotoxic activities were shown against cervical, breast, colorectal and lung cancer cell lines in their study. We proved that our extracts, particularly hexane extract, had bioactivity on SKOV3 cells and HUVEC cells, rather than the CAOV3 cell line. Even though water extract from CZ was found to be highly toxic to SKOV3 cells and HUVEC cells, the compounds in water extract may contain some fatty material in micelle forms which may contribute to the toxicity. Therefore, we focused on hexane extract to identify compounds by using GCMS. Our study showed that HE-CZ from Myanmar showed a more cytotoxic effect on Metastatic Ovarian Cancer cells and HUVEC cells than primary ovarian cancer CaOV3 cells. This finding demonstrates that HE-CZ from Myanmar may have potential anti-cancer activity in metastatic ovarian cancer. We extend our appreciation to University of Malaya for financial assistance through UMRG grant RG-360/11HTM and UMRG-Frontier Science Grant RP021D-14AFR. Our special thanks go to Didi Erwandi from SUCXes laboratory, Pharmacology Department, FOM, UM for his kind technical assistance. Ferlay J. GLOBOCAN 2012 v1.0, Cancer Incidence and Mortality Worldwide. IARC Cancer Base No.11 International Agency for Research on Cancer (IARC) 2013. Stewart SL. Ovarian cancer incidence: current and comprehensive statistics. in ovarian cancer-clinical and therapeutic perspectives. Samir Sarghaly 2011; 1-13. Azizah Ab M, Nor Saleha IT, Noor Hashimah A, Asmah ZA, Mastulu W. Malaysian national cancer registry report 2007-2011. National Cancer Institute, Ministry of Health, Malaysia 2011. Sivanesaratnam V, Lim BK. Ovarian cancer. Essentials of Gynaecology (2nd Ed.). New Delhi. Jaypee Brothers Med Publ 2011; 437-448. Geoffrey AC. Natural products in drug discovery-creating a new vision. Phytochem Rev 2002; 1: 261-273. Hossain S, Kader G, Nikkon F, Yeasmin T. Cytotoxicity of the rhizome of medicinal plants. Asian Pac J Trop Biomed 2012; 2: 125-127. Kress WJ, DeFilipps RA, Farr E, Kyi DYY. A checklist of the trees, shrubs, herbs, and climbers of Myanmar. United States National Herbarium 2003; 45: 1-590. Lobo R, Prabhu KS, Shirwaikar A. Curcuma zedoaria rocs. (White turmeric): a review of its chemical, pharmacological and ethnomedical properties. J Pharm Pharmacol 2009; 61: 13-21. Cordier W, Steenkamp V. Evaluation of four assays to determine cytotoxicity of selected crude medicinal plant extracts in vitro. Br J Pharm Res 2015; 7: 16-21. Syu WJ, Shen CC, Don MJ, Ou JC, Lee GH, Sun CM. Cytotoxicity of curcuminoids and some novel compounds from Curcuma zedoaria. J Nat Products 1998; 61: 1531-1534. Myoungae K. Cytotoxic activity of the extracts from Curcuma zedoaria. J Toxicol Public Health 2003; 19: 293-296. Athima S, Arunporn I, Chawaboon D, Chatchai W, Niwat K, Pranee. Cytotoxic activity of Thai medicinal plants for cancer treatment. Songklanakarin J Sci Technol 2005; 27: 469-478. Lakshimi S, Padmaja G, Remani P. Antitumour effect of Isocurcumenol isolated from Curcuma zedoaria rhizome on human and murine cancer cells. Int J Med Chem 2011. Rahman SNSA, Wahab NA, Malek SNA. In vitro morphological assessment of apoptosis induced by anti-proliferative constituents from rhizomes of Curcuma zedoaria. Evid Based Compl Alt Med 2013. Hamdi OAA, Rahman SNSA, Awang K, Wahab NA, Looi CY, Thomas NF, Malek SNA. Cytotoxic constituents from the rhizomes of Curcuma zedoaria. Sci World J 2014. Hamdi OA, Anouar el H, Shilpi JA, Trabolsy ZB, Zain SB, Zakaria NS, Zulkefeli M, Weber JF, Malek SN, Rahman SN, Awang K. A quantum chemical and statistical study of cytotoxic activity of compounds isolated from Curcuma zedoaria. Int J Mol Sci 2015; 16: 9450-9468. Seo WG, Hwang JC, Kang SK, Jin UH, Suh SJ, Moon SK, Kim CH. Suppressive effect of Zedoariae rhizome on pulmonary metastasis of b16 melanoma cells. J Ethnopharmacol 2005; 101: 249-257. Chinese Pharmacopoeia Commission. Chinese Pharmacopoeia 2005; 1: 194. Jeong SJ, Koh W, Lee EO, Lee HJ, Lee HJ, Bae H, Lu J, Kim SH. Antiangiogenic Phytochemicals and Medicinal Herbs. Phytother Res 2010. Pasquier E, Carre M, Pourroy M, Camoin L, Rebai O, Briand C, Braguer D. Antiangiogenic activity of paclitaxel is associated with its cytostatic effect, mediated by the initiation but not completion of a mitochondrial apoptotic signaling pathway. Mol Cancer Ther 2004; 3: 1301-1310. Arya A, Achoui M, Cheah SC, Adbelwahab SI, Narrima P, Mohan S, Mustafa MR, Mohd MA. Chloroform fraction of Centratherum anthelminticum (L.) seed inhibits tumour necrosis factor and exhibits pleotropic bioactivities: Inhibitory role in human tumour cells. Evid Based Compl Alt Med 2012. Looi CY, Arya A, Cheah FK, Muharram B, Leong KH, Mohamad K, Wong WF, Rai N, Mustafa MR. Induction of apoptosis in human breast cancer cells via caspase pathway by vernodalin isolated from Centratherum anthelminticum (L.) seeds. PLOS One 2013. Shiobara Y, Kodama M, Yasuda K, Takemoto T. Curcumenone, curcumanolide A and curcumanolide B, three sesquiterpenoids from curcuma zedoaria. Phytochem 1985; 24: 2629-2633. Shiobara Y, Kodama M, Takemoto T. Zedoarol, 13-hydroxygermacrone and curzeone, three sesquiterpenoids from Curcuma zedoaria. Phytochem 1986; 25: 1351-1353. Hong CH, Lee SK. Sesquiterpenoids from the rhizome of Curcuma zedoaria. Arch Pharm Res 2001; 24: 424-426. Navarro DF, Souza MM, Neto RA, Golin V, Niero R, Yunes RA, Monache FD, Filho VC. Phytochemical analysis and analgesic properties of Curcuma zedoaria grown in Brazil. Phytomed 2002; 9: 427-432. Makabe H, Kuwabara A, Kamo T, Hirota M. Anti-inflammatory sesquiterpenes from Curcuma zedoaria. Nat Prod Res 2006; 20: 680-685. Mau JL, Lai EYC, Wang NP, Chen CC, Chang CH, Chyau CC. Composition and antioxidant activity of the essential oil from Curcuma zedoaria. Food Chem 2003; 82: 583-591. Park GG, Eun SH, Shim SH. Chemical constituents from Curcuma zedoaria. Biochem Sys Ecol 2012; 40: 65-68. Angel GR. Antioxidant and antimicrobial activity of essential oils from nine starchy Curcuma Species. Int J Curr Pharm Res 2012; 4: 45-47. Singh P, Singh S, Kapoor IPS, Singh G, Isidorov V, Szczepaniak L. Chemical composition and antioxidant activities of essential oil and oleoresins from Curcuma zedoaria rhizomes. Food Biosci 2013; 74: 42-48. Chen W, Lu Y, Gao M, Wu J, Wang A, Shi R. Anti-angiogenesis effect of essential oil from Curcuma zedoaria in vitro and in vivo. J Ethnopharmacol 2011; 133: 220-226. Gao XF, Li QL, Li HL, Zhang HY, Su JY, Wang B, Liu P, Zhang AQ. Extracts from Curcuma zedoaria Inhibit proliferation of human breast cancer cell MDA-MB-231 in vitro. Evid Based Compl Alt Med 2014. Atienzar FA, Tilmant K, Gerets HH, Touissant G, Speeckaert S, Hanon E, Depelchin O, Dhalluin S. The use of real-time cell analyzer technology in drug discovery: defining optimal cell culture conditions and assay reproducibility with different adherent cellular models. J Biomol Screen 2011; 16: 575-587.